A healthy lifestyle can be achieved anywhere in the world and Pattaya is certainly one of the most popular places people choose to stay fit and in shape. Thailand has a tropical climate and is therefore ideal for the pursuit of outdoor activities. There are the regular water sports such as kayaking and windsurfing, beach activities such as volleyball and beach football along with scuba diving, golf and much, much more. Keeping fit and healthy may not be one of the first things that you think about when you come to Pattaya, after all, there are so many other distractions and activities but it is something that everyone can take part in. You can walk on the recently improved promenades at both Pattaya Beach and Jomtien Beach or why not take an evening stroll around Buddha Hill at Pratamnak? There really is plenty to do without breaking the bank. If you are looking at being a little more active and considering going to a gym, you will find some excellent options all around the city. Gyms are in most areas and for those living in East Pattaya, you can find the superb Castra Gym where you can buy all the necessary supplements to help with your workout. You will also find several places where you can play tennis, squash or badminton to help you keep in shape. Of course, one of the main benefits of coming to Pattaya in terms of sports and fitness is golf. Please see our golf guide for more details on this but Pattaya and the surrounding area has some of the finest in all of Thailand. If you are here alone you don’t need to be worried as you can always hire clubs and shoes and join one of the many gold societies in the city. Regular trips are organised from The Sportsman on Soi 13 and O’Gara’s to name just a few. These are fantastic groups for meeting new people whilst staying healthy at the same time. Fitness, health, and wellbeing are all incorporated under the same banner. In addition to the excellent gyms, water sports and other recreational activities that take place in the city, there are also a number of yoga and pilates studios. If you are in a need of a bit of pampering, you could consider visiting one of the vast number of 5 star health massage organisations such as Jomtien Sauna, beauty parlours, plastic surgery clinics, spas and fitness centre mean that Pattaya really is the place to improve your overall health and look. Many people now choose to partake of the various treatments from facials, to waxing and detox to Botox in order to gain that healthier looking body and due to the current price of treatments in many western countries, Thailand has found itself an entire new market in patients arriving for plastic surgery treatment and general medical operations which in their own country would cost much more than locally in Thailand. All fitness and healthy living plans must obviously incorporate a healthy diet. That means eating the right foods, where necessary, taking the correct supplements, and generally leading a healthier lifestyle. In Pattaya, you will find a number of stores selling quality, fresh produce along with healthy shakes and raw food cafes. Many of the expat focused supermarkets also have stocks of healthy foods that you may be more familiar with from home. 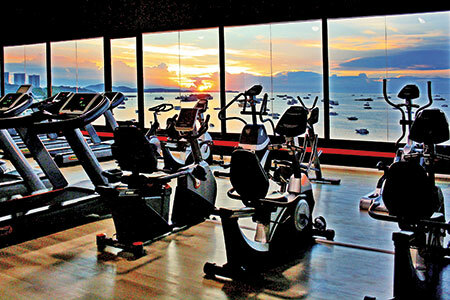 All in all, staying fit and healthy in Pattaya can be a straightforward task if you are committed to it. Everything that you require is here including the top-class gyms, the water sports, the yoga studios and health food cafes. When you combine this with the excellent year round climate and pleasant places to walk, there really isn’t any excuse for not looking after your personal wellbeing.